The title of the blog is slowly becoming a misnomer. Mostly for the fact that I rarely collaborate with others on food (nor write for that matter). At times it's more like Eats with Skipper, which is what nearly every Wednesday for a good month or so was. It started with my trivia group meeting at Maya's Taqueria for the $1 taco happy hour before heading off to trivia because we, sadly, had bored of the Shack's regular menu. It's good food but after two years of almost weekly attendance, it was no longer something to look forward to. After a few weeks of pre-trivia visits to Maya's, I threw it out that I should just make tacos for us before trivia, and it was a done deal. The first couple times were traditional Mexican-styled tacos, but then I decided to see what I could make work in taco form and then make my friends eat it. 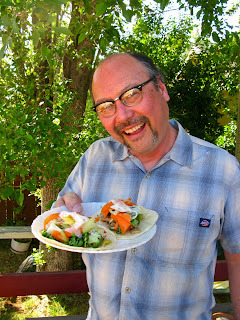 With that, I give you the banh mí taco eaten by Dennis Yudt pictured below. 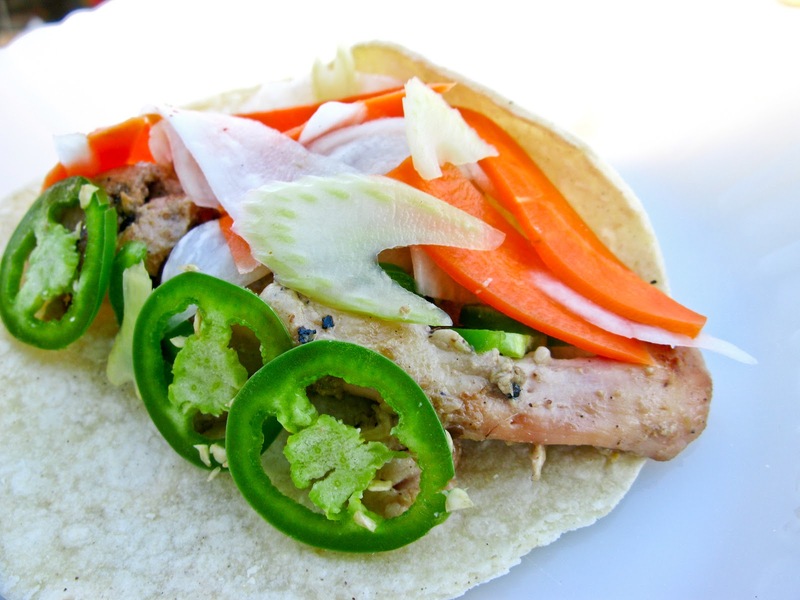 It's your standard taco-sized white corn tortilla but with the ingredients of a traditional banh mí variation set inside: grilled lemongrass chicken, sliced jalapeño fruit, and do chua pickle mix. I've found that 30 minutes is enough time before using it. This can be used for a few days, but I don't like the texture after three days. Finally, you go and buy a $100 mandolin, adjust it to the slimmest slice setting, and slice one jalapeño and frugally divide it among your friends' tacos. No great shakes unless you like banh mí, that is. I love this idea. Two of my favorite foods!